I didn't want to be the type of person that uploads negative reviews, but at the same time, this is my space where I voice my opinions. 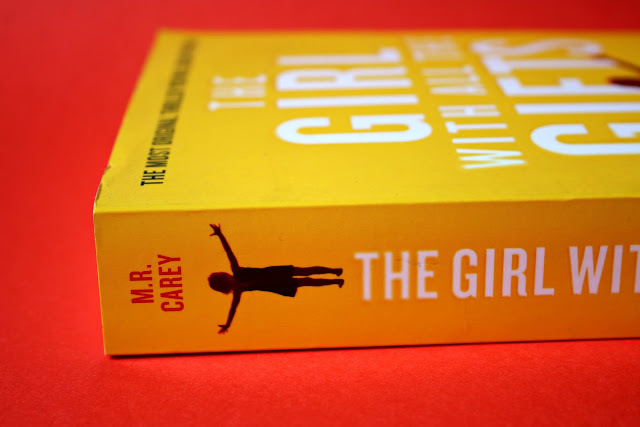 I was anxious to talk about this book because I know so many people love it and, as you might have guessed, I really didn't like it. I actually couldn't even finish it. That's not to say that you, reading this, won't enjoy it, but it just wasn't my cup of tea. I'm not going to go on a big rant and telling you to not bother spending your money on this book, but I'll explain why I've had to stop reading in a calm way and hopefully we can all get along! 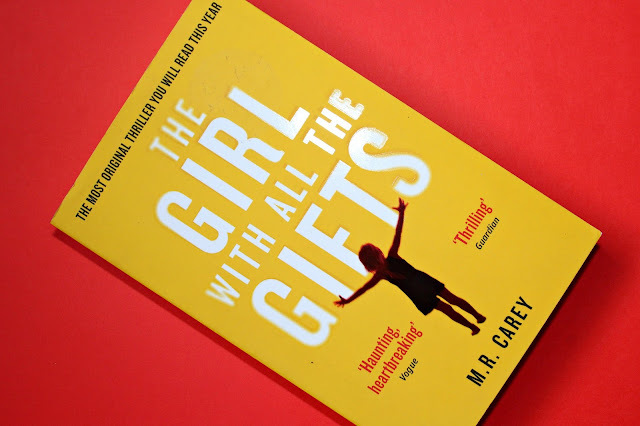 This is The Girl With All The Gifts by M.R. Carey, a dystopian, zombie-esque novel with a bit of thriller thrown in. It's fairly long - 460 pages - but I only managed to get to 230 before I had to put it down. two of his people strap her into the wheelchair. won't bite. But they don't laugh." I'll be honest, that blurb did grab me, despite the fact that this is a zombie novel. I promise you, that's not a spoiler! You find out within the first few pages about the zombies or "hungries", so as always, no spoilers here. I'm not much of a zombie fan, though. When it comes to horrors, I'm into the supernatural and mythical, like ghosts and vampires. Despite this, I thought I'd give it a go and stuck it on my Christmas list. It was my auntie that had bought it for me, and I started to read it at the end of March. Yep, you read that right, the end of March. It's taken me that long to get halfway through the book. I tried so hard to finish it, but found myself putting it down after a few pages, and I think part of it was because of my disinterest in zombies. Whilst the zombies in the book aren't your typical zombies, they're zombies nonetheless. I also didn't feel a connection to any of the characters. Not even Melanie, the main character who is a child! I didn't pity anyone, nor was I willing anyone to live, which sounds so awful, but what I mean is that I felt like my life wouldn't have been impacted if any of the characters died. The person I probably liked the most was Miss Justineau, as she was a pretty strong woman, but just really lacked in likeability, and a lot of her characterisation was built around her looks and the male characters' attraction to her. Like, why do we need to know that Sergeant Parks takes a peek at her lady garden while she pees? He was the person that I disliked the most, Sergeant Parks. I was getting so sick of him stomping about and using his military voice about all aspects of life. If I was in the world of the book, I think I would've punched him by now. Speaking of voice, there were parts of the book that I liked, which were told through Melanie's voice, although I definitely read it in a girl around 7's voice, rather than 10. Those parts were really good because it definitely upped the creepiness where it was lacking before, but this would usually get shattered in the next chapter, where we would read it in a doctor's voice, or a teacher's voice, or a military voice. It all became a bit much to have to switch between the characters and then have to read through some of their waffle. Like Dr. Caldwell, for example, her parts of the story were so sciencey that I just couldn't keep up. She gives a really detailed explanation of how she cuts open someone's head to retrieve the brain, and it's just so full of jargon that I skimmed ahead. I think sometimes, it's best to just gloss over these details and leave some things to the imagination. It would be a much shorter book if there wasn't so much waffling! There is a huge amount of world-building too, which becomes quite smothering. My feet were starting to hurt from the amount of walking and running around that the characters were doing, not to mention the headache that was starting to form, thanks to all the descriptions of the landscape. I mean, if you're into finding out about the world that a book is set in in extreme detail, then you may love this. My final thought on this book is this - it's almost like a play, in that it has two acts. The first act is at the base, where the story is the most interesting and captivating. We're learning about life in the base and why Melanie is there, so we get a lot of crucial information, despite all of the science nonsense. The second act is where it starts to go downhill for me. It's life after the base and everything kind of becomes slow and just a drag to get through. There were times were it was creepy or tense, which gave a lot of promise, but usually fell through, leaving me disappointed. In all honesty, I just got bored and lost all interest in the story. I'm very sorry if this is one of your favourite books, but I've got a pile of more exciting things just waiting to be read! I'd say that if you love zombies and stories that are more female-slanted, then you should give this a go. Who knows, maybe I'll pick this back up at some point in my life and try again. It's okay having opposing views to popular opinions. As you said, this is your blog and should reflect your thoughts. I've picked up several books that sounded good on the back cover, which I put down half way through. Also, zombies aren't usually my thing... but it's always good to give another style of novel a read. So so pleased to have stumbled across this blog post. I picked up this book about a week or so ago, and only got to about page 50 before having to give up. I thought I was the only one who didn’t like this book. The worst parts for me were the detailed, violent bits, I found it just to upsetting to carry on. I was hoping this book would be a good one to read over Halloween, I liked the creepiness to an extent, just not the graphic descriptions. You seem to have got a little further with the book than me, and although you didn’t finish it, I liked reading how you found it. Yes, I totally agree! There was a part near the beginning where the doctor graphically describes cutting into a child's head and it actually turned my stomach. It's definitely not for everyone, so you aren't alone! I'm glad that I'm not alone too though, as this book as so many good reviews and I just couldn't be one of them.